Green screen, technically referred to as chroma key, is the process by which a solid color can be removed from an image and replaced with another image. This is typically accomplished by setting up a green fabric background behind your photo subject. 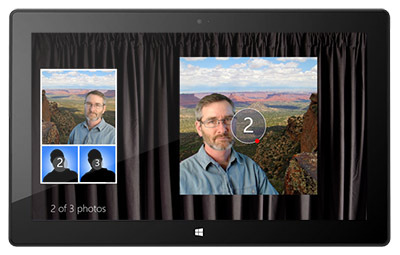 Then Instant Photo Booth can replace the green color with a user-selected background image. You can specify a single background for all users, or allow them to pick one from any number that you supply. For example, the image at right was made in the Norris Family Industry development studio in chilly Estes Park, Colorado (note the sweater), while the background is from a steamy papyrus swamp in central Uganda. And the image below was made in the same office with springtime in Moab, Utah as the background. World travel has never been easier! Solid color background – This can be any color. 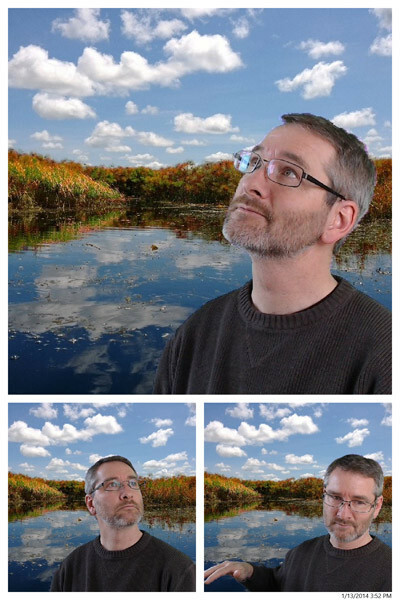 Instant Photo Booth allows you to adjust the chroma key color, but it has been preset to lime green, which is typical since most people don’t wear that color. However, being able to change the color allows you to improvise in the field if needed. Try searching Amazon.com for “green screen” and you will find many reasonably priced options. Even lighting – This is as important as the solid color. Even if your background is a solid color, any folds will appear darker and therefore a different color. Properly sized background images – The green screen background should be the same size as your selected photo capture resolution. This will provide the greatest performance.